Avenging their defeat Nov. 15 at Centre Sportif De L’UQAM, the Stingers steamrolled their opponents with a strong defence, fluid ball movement and teamwork. The script was simple, explained Stingers head coach Rastko Popovic heading into the game: Rebound and limit turnovers. 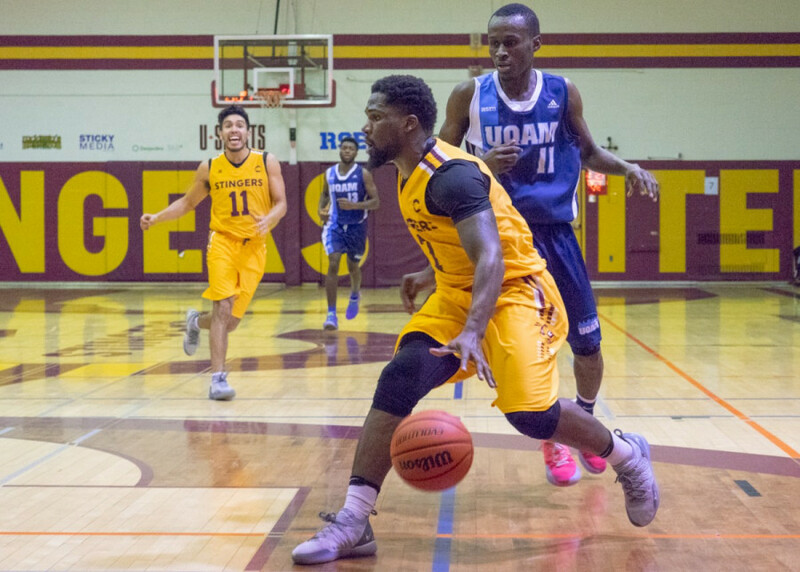 Leading the entire game, the Stingers treated fans to an impressive performance; locked in from start to finish, dominating UQAM in all categories. Their last meeting, Popovic said careless turnovers cost them the game. This time, he let it be known how important the victory was to him. “I think our guys made a lot better decisions,” he said. “We defended home court, we defended the whole game. I’m very proud of how our guys followed the scout report,” he continued. The Stingers ended the first quarter with a 21-12 lead. UQAM’s Christopher Jean—who had a team high 21 points—brought his team within five points at 26-21 hitting a jumper with 6:09 left in the second quarter, but that was as close as they’d get the entire game. Neutralizing the glass with 40 rebounds to Les Citadins’ 33, Concordia gobbelled every rebound leaving their opponents no opportunity for second chances—a theme Stingers Forward Sami Ghandour felt made the difference. “Usually the rebound rates win you the game. We got a lot of offensive rebounds and that helped a lot to get those open shots,” said Ghandour who now seems to be finding his rhythm coming back from a shoulder injury. With a game high 33 minutes under his belt, Ghandour may have only scored nine points in the rematch but Popovic stressed that his star forward impacts the game in other areas. Since Ghandour’s return Nov. 22, the Stingers’ offence has been a problem for opponents, with points for totals of 87, 105 and 83 in their last three outings respectively. Ghandour expressed the fact that the team is just having fun out there. “We’ve just been finding each other a lot better as a team these past couple of games. Our chemistry is back and we’re feeling better, especially offensively,” he concluded. At the end of the third quarter, Concordia ballooned their lead to 23. The Stingers not only blew the game wide open knocking down 10 three-pointers, but they also limited their turnovers—eight fewer than the first game. Joining the fun were Adrian Armstrong and Ricardo Monge, each hitting four threes in the game for the Stingers. Monge finished with a team high 22 points, leading the team in total points thus far this season. As the offence connected on all cylinders, putting Les Citadins away required defence. With a perfect showing from the free throw line (8-8), guard Cedrick Coriolan understands how vital his role is on the team. Coriolan made it clear that Concordia wasn’t going to make the same mistake twice. He knew UQAM would play with the same intensity they did in the first game, but his side would be up for it. Third year forward Olivier Simon also contributed to the statement win as he redeemed himself from the last game putting up a double double, scoring 11 points and grabbing 11 rebounds. Concordia enters the break on a three game win streak. The Stingers sit atop the Réseau du sport étudiant du Québec standings with a 4-1 record in a highly competitive conference. Heading into the holiday break, Concordia leads the league in scoring margin (+7), assists (79), three point field goal percentage (.359), free throw percentage (.814) and scoring offence (83.6). The return of their six-foot-six Forward Sami Ghandour should keep Popovic’s team on pace for more success but he made it clear this is still business. “It’s a good way to end the [year], the boys should enjoy it,” he said. “But we’re right back to work after. Guys still have exams, we gotta do some weight lifting, some running and that’s the part that we’re looking to keep building and get better during the little break we have,” said Popovic.